Do y’all remember when I was obsessing over Tajin? I’m not a huge salt fan in general, but flavored salts? Sign me up. I probably get 50% of my sodium intake from flavored salts. 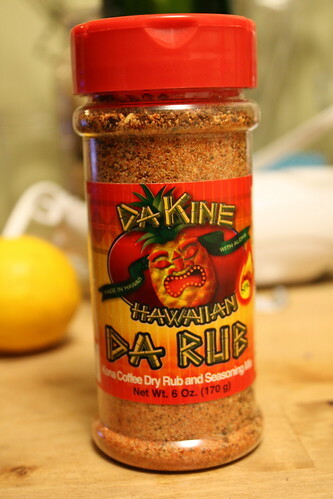 My parents were in Hawaii last year and came home with a bottle of Da Kine Hawaiian Da Rub (Mo’ Spicy). The rub contains some mystery spices, along with little flecks of Kona coffee. It’s spicy, salty, and also a little sweet, and I’m officially addicted to it. Since you can’t buy it anywhere on the mainland (that we’ve discovered anyway) and shipping is expensive, my parents ordered a case for Christmas. Since my bottle came home I’ve been putting it on everything: popcorn, roast chicken, brussel sprouts, in olive oil for a dipping sauce. And like all good food obsessions, eating it straight out of the jar. Sorry sodium levels! If anyone is in Hawaii anytime soon and happens across the smoked flavor pick me up some and I’ll pay you back. But probably you’ll be so psyched about me telling you about this delicious new food that it will be payment enough. You’re welcome. If you aren’t going to be visiting the islands anytime soon and you’d like to try them you can purchase online here. Run a race each month. Xochimilco (eat here, finish eating the alphabet).